There are thousands of apps & websites out there. We've only listed 'a few' of the top ones in a handful of categories below just to wet your appetite. There's an APP, an online store or a website for almost anything! Just click on the links to check some of these out. GROUPON a deal-of-the-day recommendation service for consumers. Every 24 hours, Groupon broadcasts an electronic coupon for a restaurant or store in your city, recommending that local service while also offering you a 40% to 60% discount if you purchase that service. Fresh ingredients & step-by-step easy 30-minute chef-designed recipes with pre-measured ingredients every week delivered to your door. Taking a break in your day to play some free online games is a great way to take a time out from the world every so often. Online games can relax you, get your brain working or just simply give you a chance to have some fun and take a break from the day-to-day. A promotional code, sometimes known as a coupon or discount code, is made up of a combination of numbers and letters. It's used for specific purposes, such as a holiday marketing campaign. When a store issues promotional or coupon codes, they're providing customers with an incentive to buy, which benefits both the customer and the business. Customers get the products they want for a lower price, and the ecommerce store generates revenue. One of the most useful things about promotional codes is that they work well with both new and returning customers. Getting a coupon, as hard as it is to believe, is physically shown to be more enjoyable than getting a gift.I cannot agree more! Often when you FIRST go to a company/store website there will be a pop-coupon asking you if you want to get on their email list to receive promotions & coupons, and often they give you one immediately just for signing up. Promotional & coupon codes often come to you directly in an email when you sign up on the company website to receive emails. Best thing to do is just do a general search for "coupon/promotional code for Bloomingdales" and see what comes up in your search. HONEY is also a great way to find deals but currently it only works on computers/laptops. 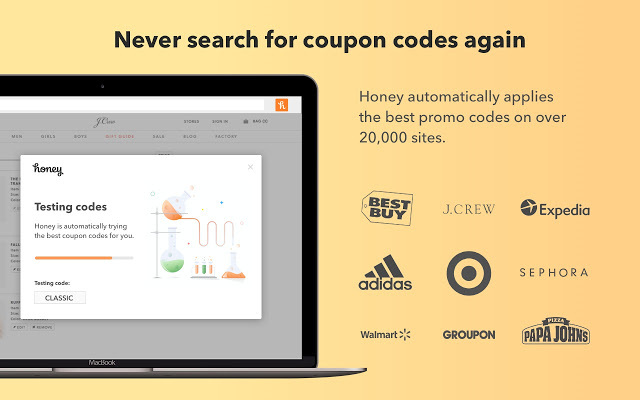 Honey is a web browser add-on that finds coupons from all kinds of places that you can use for the websites you browse. The idea behind it is to get rid of the annoyance that comes from finding individual coupons yourself, collecting them all in one place and applying them best. With discounts for over 100 stores at its fingertips it’s bound to get you savings. It works! Currently Honey only works with desktop/laptops when you shop at over 30,000 shopping sites from your computer. To start saving now, install Honey on your computer.